– the bi-monthly newsletter is back with a punch this time. The last two months have been fabulous for eWIT. Many senior eWIT members have given talks and participated in many important events related to Women Professionals. This sets the stage for eWIT, which is very recognized forum dealing predominantly with topics relating to Women Professionals. This would not have been possible without the understanding shown by the organizers for the work that eWIT does towards helping Women Professionals. The next eWIT Anniversary is just around the corner and make sure you don’t miss it. It is scheduled to take place on May 5th at a leading hotel in Chennai. This is certainly a great opportunity to hear industry leaders talk about the world today and their experiences. It is also an opportunity for you to get to know other women professionals. Make sure you register for this! We also have one more person joining the Editorial desk. eWIT welcomes Ms. Nadia Makhani to eWIT Matters. On 15 & 16 February 2014, Harvard Business School and Harvard Kennedy School hosted the India Conference. The theme of the conference was “India Turning the Page: Prospects and Paradoxes” The Conference had eminent personalities from across the world, discussing the role India plays in various industries: IT, healthcare, sports, tourism, hospitality, and many others. Among the topics on the agenda was a discussion with the leadership panel on “Women interaction in the corporate world: mentorship, support or bias?” Addressing the audience on this topic was Mrs. V.P. Rajini Reddy, Managing Director of Exemplarr Worldwide & Vice President-eWIT (Empowering Women in IT), Chennai, Anjali Bansal, Managing Partner, India; and Jyothi Narang, Chief Operating Officer, Taj Hotels - Tata Group. The panel was moderated by Spencer Stuart Asst Professor at Harvard Business School, Lakshmi Ramarajan. Mrs. Rajini Reddy spoke on interaction among employees in the IT / ITES, focusing on the BPO and SME segment. Ms. Jyothi Narang, given her 30 years of experience in TAJ group of Hotels, spoke about the interaction across large corporate groups like TCS. Ms. Anjali Bansal discussed interaction across all corporate companies in general. Women, especially from rural India, play a multi-faceted role in the society. When they join the corporate world, they find it hard to cope with their personal and official responsibilities because of the rigid systems existing in the company. To help women employees, companies like Exemplarr adopt various women friendly policies such as flexible working hours, work from home options, etc. In order to promote interaction among them, the company also encourages women with common interests to form smaller groups to share issues and mutually find solutions. For instance, women with children of the same age group come together to share ways for better parenting. Another issue that Indian women in the corporate world face is their marriage. In India, when a woman gets married, she is expected to relocate to the groom’s place regardless of her career which takes a back seat because of the relocation. Finding a job in the new location means starting from scratch and a long time to build an image in the new organisation. In an attempt to provide a solution to this problem, companies now have taken efforts to partner with matrimonial websites so it becomes easier for these women to find grooms who have the same priorities as they do. This way, they are closer to eliminating the need for relocation. Mrs. Rajini Reddy also touched on how mentorship works. It is the person who wants to be mentored that has to look for a mentor and not the other way round. It is not necessary that there must be only one mentor per person. Depending on the subjects or skills being sought, there can be many mentors for a person. An important flipside in mentorship is that there is the danger of the trainee being over dependent on the mentor for every little thing. On the other hand, good mentorship results in the developing capabilities that can make the trainee take independent and wise decisions. There must be a clear line drawn by the mentor to avoid the danger of over dependence. Also, people may find it uncomfortable to discuss the issues they face in an organisation with their “mentor” who is also from the same organisation. We are talking about a country where there is still a stigma associated with counselling. At this juncture, it becomes difficult for a person to open up to their mentors with their problems in the organisation. For this reason, external consultants are brought in to bridge this gap. Under the Academic Initiatives of eWIT, Ms. Sarada, CEO – CI Global Solutions and eWIT member, handled a session on the Future Ahead at Saveetha Engineering College, which is an Academic Member of eWIT. There were around 300+ students from the 2nd and 3rd year who participated in the session. This session was aimed at creating awareness on the potential of the youngsters and how they can excel in their career. Ms. Sarada started with the statistics of gender diversity survey by Gender Diversity Benchmark, 2011, which states that India has the lowest national women labour force and the worst leaking pipeline for junior to middle level position women. Of 1,112 directorships on the Bombay Stock Exchange, just 59 (5.3%) are held by women. She went on with a quiz on some of the women leaders from various industries and asked the students to identify the women shown in the pictures. She also explained the significant achievement of these women leaders like Indira Nooyi, Indu Jain of Times Group, Mallika Srinivasan of TAFE, Simone Tata of Tata Oils, Kiranmazumdhar Shaw of Biocon, etc. This was great fun for all the participants as they could identify a few and had to make wild guesses about others. For many, this was an eye opener on the existence of very determined women in various industries, who, by their sheer grit and determination, have brought accolades to their companies and their industries. The next topic was what the corporate look for in their employees such as technical knowledge, hard work, high energy, networking capabilities, good communication skills, entrepreneurial spirit, etc. Then followed the Top 5 Women in Technology under 30, and how they have got to the top of Technology ladder at a young age. They have created a worldwide ripple either being at Facebook, or being Chief Information Officer of City of New York of a Startup, delivering POS systems for iPad, etc. These were Libby Leffler, Anastasia Leng, Rachel Haot, Lisa Falzone, and Naomi Gleit. The last part of the session contained 5 key points for professional success – The 5 Ps: Purpose, Professional Competence, Personality, Preparedness to give, and Passion. The session concluded with Q&A in which students and the faculty asked questions on their career choices, work life balance, etc. The National HRD Network is the National Apex body of professionals (established 25 years ago) committed to promoting the HRD movement in the country and enhancing the capability of human resource professionals to compete globally and thereby creating value for society. 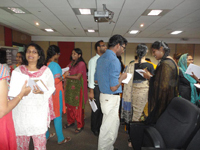 The Chennai Chapter of the National HRD Network was one of the first chapters to be set up. It has been functional since 1987 and has a diverse membership, drawn from the 'old economy' sectors of manufacturing and engineering companies as well as from the growth sectors such as IT, ITES/BPO as well as telecom and insurance. She gave examples of the most common cases of harassment pertainingto the IT sector, where the harassment issues are much more rampant. The speaker stressed upon a social understanding that is prevalent amongst people in the society today: “If the girl is open to socializing and heading to a pub then they are ok with everything.” For every reported case, 25 moresevere cases go unreported. She spoke ofthe men in the life of theaggrieved women not willing to support. The perpetrator getting away with “Ididn’t mean it” usually throws the incident away from him but the traumacreated, thedignity robbed, always makes a woman feel cheap. Today, even movie innuendoes are termed harmless but the actual scene is not so. She concluded by saying that the society doesn’t understand that the woman gets scared when her personal space is invaded and it is all the more easy for the perpetrator to escalate the level of harassment once the victim is scared. In IT and ITES sector, perpetrators often gang up internally and cover up anyloose ends pretty well. In most cases, HR is totally desensitized. She made a strong pitch for women to report cases of harassment and not let them go unreported. Usha Srinivasan gave two examples of sexual harassment that is commonly noticed in the BPO sector. In the first case, a supervisor places his hand on the woman internee whois holding a mouse in an ostensible attempt to teach her on operation ofthe computer. He defends his action on grounds that she is being mentored by him. The internee complains about his action to her HR who okays theaction of the supervisor as a normal practice. When the complaint is made to the Internal Complaints Committee (ICC), the committee wanted to know whether it is a common practice in the organisation.Since this was not so, the ICC found both the supervisor and HR at fault for propagating such a practice. According to Usha, who has seen many cases across different organisations, for every case that gets reported in the BPO industry, there are twenty five such cases which go unreported since women do not have the courage to complain. In fact in her words,"the BPO world has become a world of 25 nothings!! These people like to party hard. Whereas there is nothing wrong in partying, there are limits to be observed". In another case mentioned by her, the supervisor invited a woman colleague to accompany him on a bike for coffee outside, It may not seem out of place in the industry. But if the colleague finds such an invitation odd, she could refuse it. In the instant case, the supervisor had a habit of inviting several of his women colleagues to accompany him on his bike. When the matter was reported to the ICC, he was questioned on this practice. His response was that he sent out invites on SMS to several women colleagues and not one in particular. His defence was that at least one of the colleagues would respond to his invite! The women colleagues who deposed before the ICC were asked as to why theydid not complain to their parents or senior colleagues. The standard answer was they would be asked to stay at home, after they made a complaint. The girls are scared of dire consequences at the home front if they report it to the ICC. The ICC recommended dismissal of the supervisor on grounds that he made his female colleagues not feel equal to their male counterparts. In view of International Women’s Day on March 8th, Centre for Empowerment of Women at Anna University, Chennai had organised an event on March 7th, celebrating International Women’s Day as well as Inauguration of Women Engineered Empowerment Establishment(WEEE). The guest of Honour at this event was Ms. Vijayalakshmi Rao – Co-founder & Advisor, eWIT along with Prof Dr. R. Ganesan, Registrar of Anna University. The event was conducted in the presence of Prof Dr. C.Chellappan – Dean, CEG Campus, Prof. Dr. S. ThamaraiSelvi – Dean, MIT Campus, Prof Dr.S. Sivanesan – Dean, A C Tech Campus and Prof Dr. Ranee Maria Leonie Vedamuthu – Dean, SAP Campus. She highlighted the fact that Education endows a person with empowerment, though it is not a prerequisite. It is most fundamental. The first step to empowerment is to start by empowering yourself is to put your education to use- Education leading to employment/entrepreneurship. The next step is keep updating one’s knowledge through newspapers, free websites such as courser and it is also important to develop your soft skills, look up to role models & mentors. It is important to be focused & chart out a career path for oneself. It is about constantly looking for opportunities and not getting disheartened in the absence of a suitable placement. It is most important to appreciate what you have & not what you don’t! She said : “Let me take my own example. Though I have been working in industry for more than 30 years, the 2 associations I most cherish are eWIT(Empowering Women in IT) and and ANEW (Association of Non –traditional employment of Women). I cherish eWIT, because a group of us in industry get together and try to address issues which aid in empowerment of women in IT. At ANEW, we train underprivileged girls and help them find employment.I understand today is a very important day for all of you since Anna University is inaugurating Women Engineered Empowerment Establishment, a university-wide Women Empowerment drive covering 600 colleges. She congratulated Anna University and wished the initiative all success. The Headstart Network Foundation is an organization with the vision to ‘Change the World through Entrepreneurship’. It has been among the first few, to have driven informal and formal meets of aspiring and inspiring entrepreneurs in India – as early as 2005 -06. Today, Headstart Network Foundation is the largest network of early stage startups in India. It facilitates entrepreneurial learning, hiring, marketing insights and peer mentoring amongst the startups and addresses their issues various initiatives. One such initiative is Headstart: Startup Saturday, where various startups meet together and get to listen to eminent personalities share their knowledge. Viji first brought out some interesting points about Women Entrepreneurship from the Global Entrepreneurship Monitor. For eg There are 126 mil women running new businesses, and 98 mil operating established businesses and the numbers are growing! Data from 70 countries indicates that lending to women was associated with lower risks. From traditional sectors like food, handicrafts, fashion etc, Indian Women Entrepreneurs (WEs) are now increasingly moving to education, media, healthcare, on-line services and IT-led businesses. Entrepreneurial activity creates growth and prosperity — and solutions for social problems. And today’s trends show that women will be a driving force of entrepreneurial growth in the future. WEs have some distinct strengths such as being very passionate & committed, giving their best even at times of crisis. They are very creative and also want to give back to society. But some of their key weaknesses includes that of not being very good in marketing and negotiations. They are also risk averse and are afraid of failures. They also need to integrate technology a lot more. She concluded by motivating the WEs to Dream big, network better and make the most of opportunities available. International Women’s Day was celebrated with a lot of fanfare across all organisations and many senior eWIT Members were important participants in that. 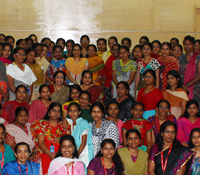 Tech Mahindra Kalyani Narayanan, Advisor - eWIT Is there a glass ceiling at the workplace? At Hexaware, International Women’s Day celebrations were a week long, and reached culmination on 7th March with a two hour event, celebrating IWD. The week’s highlights included a role model talk by the company’s HR Head, a talk by a gynecologist and a poster competition, plus other activities. Ms Nirmala (Associate Vice President, HexaVarsity - Hexaware Technologies), also a governing Council member of Ewit, spoke on the theme: “Taking Charge“. Though ‘Taking Charge’ is the theme for the year 2014, women have by and large have already ‘Taken Charge’, since a very long time. As a daughter, women have been conscious of our parents’ hardships, and have always been a source of support to our family. As a wife, women have supported their husbands and the newly acquired family. As a mother, women have done what their mothers have done in holding the family together and making sure the family is taken care at all times. The purpose of women’s lives has always been the wellbeing of the family. In this endeavour, women have compromised with likes and dislikes to the purpose of life. This has become their second nature and part of their DNA. Now we need to change to be in line with the new theme for the year 2014. A little tweaking to our current purpose of life is the need of the hour. In addition to the ‘Happy Family,’ let us get a bit selfish and think about our own aspirations. Most of the successful career women have a happy family behind them – there is nothing wrong in repositioning the purpose of our lives. We can, we should and we will! The event was well attended and there was a full house with both women and men attending. In other words, women at Hexaware took charge! As part of International Women’s Day festivities, Kalyani Narayanan – Kalyani Narayanan – CEO of easyinsuranceindia&Advisor,eWIT was an external judge at TechMahindra on March 12th, 2014. Kalyani was a judge on the topic ‘Is there a glass ceiling at workplace, at social set up, and at personal level?’ There were a team of 4 people to speak for and 4 to speak against. The TechMahindra judge left the final decision to Kalyani Narayanan. Based on what the teams presented, Kalyani Narayanan said that there is indeed glass ceiling at workplace, however, there is no such thing as glass ceiling for women in social set up or for women at personal levels. So, both teams won for their arguments in respective topics. As part of the academic initiative by eWIT, Kalyani Narayanan – CEO of easyinsuranceindia& Advisor -eWIT, addressed an audience of women students at Vivekananda Institute of Technology for Women, Coimbatore. This event was held commemorating International Women’s Day with a festival organised for it on 8 March 2014. The grand inauguration of the International Women’s Day Festival took place where nearly 2000 women students participated in the event. More than 10 dignitaries including Kalyani delivered speeches. Thereafter, Kalyani Narayanan participated in a panel discussion on the Dimensions of 21st Century women. She spoke about the progress that is happening in the education sector, the strict laws being enacted to protect the women at workplace, and also the ever increasing job opportunities for women in the IT/ITES sector. She emphasized that the biggest challenge that women in 21st century India still facing is that of gender stereotype. The movies, advertisements, and mass media still focus largely on women confining to their traditional roles. Her advice to the students was to be conscious of the stereotypes and ensure that they bring up their children, be it a boy or a girl, in a gender neutral environment at home. eWIT conducted it’s annual “eWIT’s Excellence Award - 2014”, a much looked forward to Paper Presentation Contest which is designed to unleash the potential of IT/ITES woman professionals, to showcase their talent and expertise in their respective areas, and this opportunity was extended to woman students too. Candidates from various organizations had registered to take part in the contest and sent in their papers from which the eminent panelists had evaluated the papers and short listed 4 papers each in Technology and Human Resource, Quality categories for oral presentation. 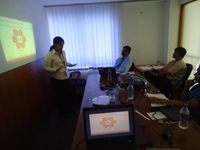 The oral presentation for all the categories was held on 15 March 2014 at the premise of RR Donnelley. The event had a healthy and tough competition amongst the 4 short listed candidates each in all categories and the event was teeming with ideas and conversation. The panelists gave suggestions and ideas to candidates for improvising their presentation. The winners in each category will be rewarded with a cash prize of Rs.10000 and Rs.5000 for the first and second place respectively in eWIT’s 8th Anniversary event on 5 May 2014.
eWIT thanks to the following panelists and judges for the support and guidance to us to make this event a great success. We look forward to your continued support for our future events. eWIT thanks the volunteers from eWIT member companies who helped us in conducting the Oral Presentation sessions smoothly. KCommunity India is a Knowledge Management Initiative by CII (Confederation of Indian Industries). KCommunity Chennai is an active group where regular sessions organised in which eminent speakers share their knowledge about important subjects relevant to the youth of today. Ms. Viji spoke about the forum - eWIT(Empowering Women in IT) and as to how eWIT was set up by the senior women in the IT Industry to help the younger women deal with challenges of working in the IT Industry. She started the talk with a brief on the IT Industry, which is at USD $ 1 Bn,employing 3 Million people directly and creating 230000 jobs annually with exponential growth. Women in this constitute about 30% and growth of women has been stagnant over the last few years. She said that there’s a lot more that women can do and that is not being explored. She helped in increasing awareness as to Why are we(Women) are at 30% share of IT Industry employment . While the entry level recruitment is at 45% women, as one moves up the ladder, it slows down to 18% and at leadership positions it is at 5%, especially in large MNCs who look upon Gender Inclusivity very positively. Hence, It’s more about sustainability than the issue of share of women in the IT industry. She spoke about : What is sustainability? As women are younger, relocation due to marriage and maternity issues take a large part of sustainability and as women get older, Inadequate time for re-skilling, elder care responsibilities and also absence of guidance/mentorship influences the decline in sustainability. Women should think as to what they would like to do, go behind that goal and believe that it is achievable. An excerpt of her talk : She started by showing the 15 minute video of Sheryl Sandberg of Facebook on ‘Why women don’t make to the top’. She detailed leadership skills in detail and as to how women, who are at some management level can learn to handle people above you, how to interact with people who are fellow managers or colleagues, and how to lead and earn the respect of subordinates. She concluded by saying that, definitely women are capable and it is possible to hold leadership positions in the corporate world. The problem is that we are mentally programmed and stereotyped into thinking workplace is for men to succeed. So, as Sheryl Sandberg says, if we consciously ‘sit at the table’ and ‘lean-in’ we can succeed. 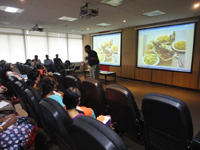 This event was streamed in their Mumbai, Bangalore, and Gurgoan offices. The feedback from the audience was tremendous and definitely gave a boost to eWIT to be a part of more such talks throughout the year. eWIT conducted a Networking 101 workshop in association with Nando’s - the international chain of casual dining restaurants, originated in South Africa. 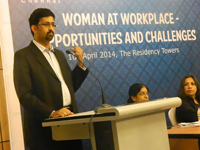 The event exclusively for women professionals was run by Mr. PravinShekar - a parallel entrepreneur. He is currently the kreator-in-chief at ‘krea’ – a new-gen research agency and the Founder-trustee of ‘The Social Catalyst’ – a non-profit trust that works towards professionalizing NGOs. The event was well attended by many women professionals across various organisations and it was a fun filled evening for all,getting to know new and old colleagues. In any way, just another evening talk. Said Pravin, giving each a bunch of cards. We had to follow, what was said in the cards. He said, making one and all get very interested. In making up lost chances, there was synergy. Enjoyed finding one with similar interests. ROI or not, this networking was fun. Don’t you miss out, next time, networking is fun. As a part of eWIT Academic Initiative, Governing Council members Lakshmi Gopal and Nadia Makhani addressed the students of Sona Engineering College in Salem, on 29 March 2014. The topics were Stress Management and Interview Etiquette. After a brief on eWIT, Mrs. Nadia had an interactive session with the final year students, where the students shared what they aspire to do after their graduation. Most of them want to work in corporate companies and their reasons for working ranged from building a career through to getting educated husbands! Mrs. Nadia explained what corporate companies are and what is expected from people working there. She briefed the students on what is expected from them, before, during and after the interview. She stressed on reading habits, which is a sure way of gaining confidence in English communication. 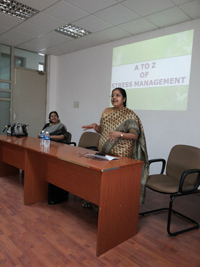 Next, Mrs Lakshmi Gopal spoke on stress management. This again was an interactive session where students were given real life experiences and tips for stress management. Mrs. Lakshmi engaged the students will short stories, followed by questions on how you woud react in a given situation. The various reactions that come up from different people in the same situation were interesting and diverse. Students were advised on the right approach in unusual situations, which will help them better cope with stress. Students were then encouraged to speak about their stressful experiences and their reactions towards them. A lot of down-to-earth advice and tips to manage stress were shared with them. Students enjoyed the informal interaction in both sessions and asked questions on day-to-day matters that may seem trivial, but are of great importance for freshers. The feedback from the college, as received from the students, was good and the college looks forward to having more sessions like this in the future. Women face a number of socio-cultural, organizational and personal challenges. What are the necessary enablers and opportunities that can be provided to help them flourish in the world of business. What is the recent law on ‘The Sexual Harassment of Women at Workplace (Prevention, Prohibition and Redressal) Act, 2013. Welcome Address by TiE President, Mr. Lakshmi Narayanan. Panelist 1: Dr. Srimathi Basu, Associate Professor of Gender and Women studies and Anthropology at the University of Kentucky. Panelist 2: Ms. Sreevidhya G, Chairman and CMD, Ravindra Services. Panelist 3: Mr. Prakash Arunachalam, VP & Head, Chennai and Pune Delivery Centers at Virtusa. 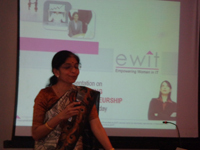 Moderator: Ms. Vijayalakshmi Rao, Mentor / Advisor, Co-founder & Advisor - eWIT. The event commenced with parallel entrepreneur, Mr. Pravin Shekar, , introducing the speakers of the day. Mr Pravin was also the Master of the Ceremony. Mr. Lakshmi Narayanan, TiE Chennai President & Chairman – Cognizant Technology Solutions, gave the Welcome address and spoke about the importance of Women at Workplaces and the strength that women have being entrepreneurs. Ms. Jennifer Mcintyre, Consul General of US Consulate in Chennai gave the key note address on the topic. She started the talk with some key numbers which are relevant to the topic and went on to explain Women at Workplace have been able to contribute positively with implementation of workplace policies which help women get back to work. She stressed that 2013-2014 has been a landmark year with the framing of sexual harassment policies and the creation of laws relating to sexual harassment at the workplace by the Govt. of India. However, for organisations which want to set up policies, she suggested that it would be best if the organisations follow the Vishakha guidelines before the implementation of the law, as the law is quite lengthy and difficult to comprehend for starters. She suggested that, in any organization where the Full time employee strength (FTE) is more than 10, it is best to implement the Workplace Sexual Harassment policy. The development of the sexual harassment policy in any organization should such that, it most easily understood and available to everyone. In addition to creation of these policies, it is important to create an Internal Complaints Cell which can be reached out to in the time of crisis. She said that it is also important to train the staff, create awareness programs and also report annually on the updated status of the sexual harassment at the workplace, to ensure that there are no untoward incidents in the future. At the time of creation of the internal complaints cell, it is important to have women from up and down the hierarchy and not just choose the women higher up in the organisation. It is also important to have an external NGO representation which can view cases objectively. It is also important to have hearings with outside members to ensure that objectivity. Investigation of cases must be completed within 90 days as it provides immediate redressal to the complainant. She spoke as to how approximately 20% of women constitute the Indian workforce and how we can make the sustainability of women at the workplace better with suitable policies. Thereafter, she opened the panel discussion. Continuing on the note started by Dr. Swarna, Dr. Srimathy stressed on the importance of implementation of laws at the workplace. She said that quite often, at the workplace, most relationships are on a ‘Quid Pro Quo’ basis where the people involved are aware that if they do something, they would get something. However, this does not include scenarios where women are made to work in Hostile work environments, where acceptance of colored jokes are meant to include the ‘Coolness’ factor and hence the implication of an impending promotion depending on the acceptance of those. In the case of a hostile work environment, often the cases don’t get filed by women due to the non-explicit nature of the harassment. Ms. G Sreevidya Chairman and CMD, Ravindra Services, spoke on how she is the only Women Entrepreneur in India to provide Security & Facility management services over the last 25 years. She started off with her own life as an example, where she did not get pulled down by not being able to be an IPS officer, instead, created a firm which would provide security to other people. She spoke at length on the challenges faced early on, in her career, where security management opportunities would not be given to her firm as it was headed by a lady and as to how she has turned it around so much so that many organisations do not even think twice before recruiting her firm for the services they need. She said that it is important to be mentally strong and not allowing women to be taken advantage of by the men in the family. As she predominantly works with the uneducated/unskilled manpower, she explained the initiatives she has taken to ensure the women personnel in her office are well trained and are able to take decisions on the ground in case of crisis. The session was extremely well attended across organisations to the extent that the speakers had to address a jam packed hall of audience.